Rusty was a stray that joined our adoption program after showing up for food at the home one of our client’s. This poor five year old guy had a facial abscess, fleas, lice and multiple broken teeth. Without the neighborhoods’ good Samaritans he probably wouldn’t have been able to survive. 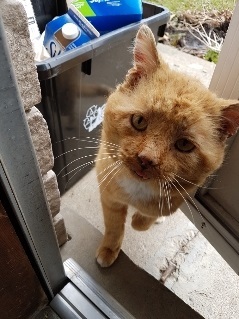 He has spent a few weeks in quarantine at the home of one of our team member’s while he was treated for lice and he will be having his teeth repaired soon. During his time in quarantine it was really easy to see what a wonderful personality this beat up boy has. 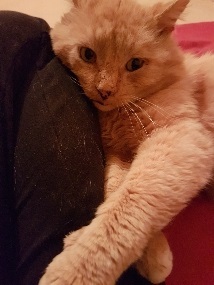 He loves attention and would happily lavish happy toes and purrs on anyone who can spend some time with him. Although he is FIV positive he longs for a kitty friend to keep him company. He spends hours watching his foster families cats play through a viewing window. Since FIV is only transferred through deep bite wounds, with the right introduction this would be safe for an existing family cat. If you think Rusty might be a good fit for your family or you have questions about FIV please feel free to contact the clinic.